Our wet-hop beers are, by nature, our most seasonally dependent. We’ve commemorated that fact by updating the recipe for SENSI 2015, the latest iteration in Sixpoint wet-hop brews. Our 2015 vintage features Cascade and Amarillo wet-hops and an increase in ABV, to 6.3%. 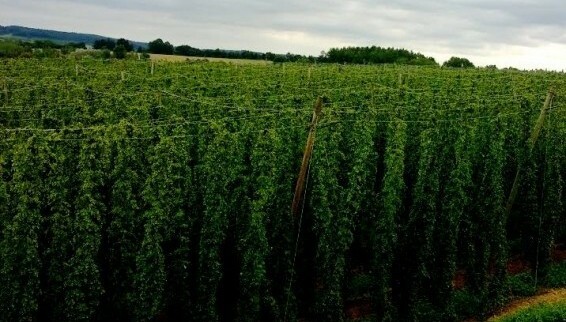 Like most any plant or spice, hop flowers begin to wilt soon after they are harvested. To preserve the essential flavors, most hops used year round have been dried and pelletized. Beers made with dried hops and pellets are obviously amazing, but there are certain intrinsic qualities and flavors of wet-hops that are inevitably altered in the hop kilns. That’s why we rush-deliver mountains of just picked hops from bine to beer in under 24 hours. Crack open SENSI and be transported out to the hop fields. SENSI 2015 is this year’s hop harvest captured in a can… the closest thing to standing in Yakima, watching the swinging bines. Note: you can get the full rundown on dry, wet, dried and pelletized hops HERE. Sometimes, lost in brewing is the agricultural nature of the process. Beer ends up on the shelf in a slick, clean package, but the dirty work of farmers in the field is easy to forget. But we have to remember… beer, at its heart, is an agricultural product. If you have the best ingredients, you can make the best beer. That’s why for Sensi 2015 we went directly to the source. Instead of going through a vendor, we shipped 725 pounds of Amarillo hops directly from Double R Hop farm, which we consider to be the best source of Amarillo in the world. When we saw those cones this year, it had to happen. It’s Mad Science.